Can You Substitute Boiled Lasagna Noodles for Non-Boiled? How Long Do I Cook Frozen Package Meatballs? 2 Can You Substitute Boiled Lasagna Noodles for Non-Boiled? 3 How Long Do I Cook Frozen Package Meatballs? This recipe is inspired from the very famous South Asian seekh kebabs, a popular street-side snack. Using chicken makes it healthier compared other red meat sliders, but trust us -- it's equally satisfying. Quick to prepare, these mini treats are a definite crowd pleaser! Mix all the pickled onion ingredients in a small container with a lid. Shake well with the lid on and let it sit for at least half an hour before use. Blend all the ingredients needed for the minty yogurt dip in a blender. Keep refrigerated. Mix together all the slider ingredients, except the chopped onions, and refrigerate for at least 1 to 2 hrs in a covered container. Combine in all the slider ingredients with a fork to keep the mix light. After the chicken mix has been refrigerated for 1 to 2 hours, mix in the chopped onions. Now you're ready to grill! Form patties depending on the size of hamburger buns. I made around 3 ½- to 4-inch patties and ended up with a total of six burgers. Grill the patties, turning halfway through. 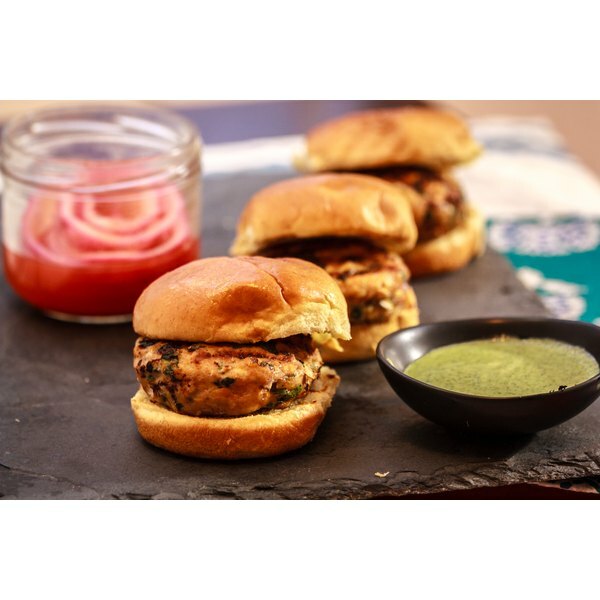 The sliders can easily be grilled, cooked on a stove-top or baked in the oven. Cooking times will vary according to medium of cooking. For safety, use a meat thermometer to check the internal temperature of the burgers. For this tutorial, I used an indoor panini press and it took around 16 to 18 minutes. Assemble the sliders and serve with the minty yogurt dip and pickled onions on the side. Enjoy! Neha Agarwal is a food & cooking enthusiast. She likes developing recipes which are easy, flavorful & inspired from her Indian background. She holds a master's degree in Human Resources & has passion for travel, entertaining and fitness.